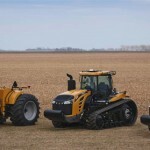 With an eye on helping farmers tackle tough conditions, Challenger has launched its MT800E Series track tractors. Available in four models ranging from 450 to 590 engine HP, these machines feature new AGCO POWER 168, 16.8L diesel engines. Bergin notes that the patented Challenger Mobil-trac undercarriage system, high-flow hydraulics and Pinnacle View cab are designed to help growers achieve longer, more productive days in the field. 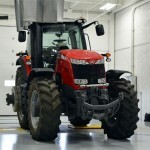 The tractor features a 16,000-pound-lift-capacity three-point hitch, heavy-duty drawbar and PTO. 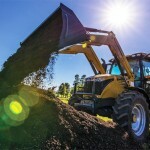 All four models in the MT800E Series feature new AGCO POWER 168 diesel engines that achieve Tier 4 Final emissions control without need for a heat-generating diesel particulate filter. The engine transfers power directly to the CAT powershift transmission, which routes the power directly to the final drive without a drop box for fewer parasitic losses with top fuel economy and performance. 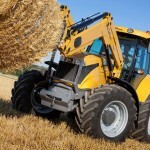 The MT800E Series features the Challenger Mobil-trac system. 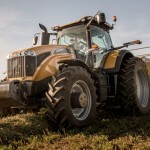 Challenger says the patented undercarriage design with oscillating mid-wheels delivers a smooth ride and a level of belt contact that puts optimum power to the ground. Key features include oscillating mid wheels, self-contained in-line track system that can be adapted to multiple applications, a friction drive system and and Marsh Mellow springs that reduce. 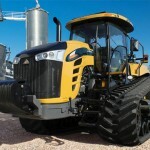 For more information on the Challenger MT800E Series, visit Challenger-ag.us.